I’d be remiss if I didn’t end this week with a little discussion about Banned Books Week (especially since it’s almost over!). Alas I’ve been double-busy because I’ve been double-sick, so I’ve been bouncing between laying down feeling nauseated and sitting up dizzying myself with tons of work that I fell behind on. 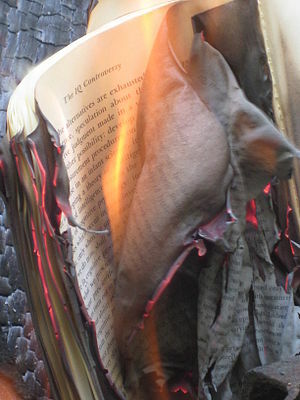 Anyhow, Banned Books Week started in 1982 – coincidentally, the year I was born – out of protest for all the “ooh please don’t offend me or my children” book burning bonanzas that were going on. I shouldn’t say were; they still are, as evidenced by the over 400 challenges reported to the Office of Intellectual Freedom last year. Now don’t get me wrong, there are plenty of legitimate reasons to object to your eyes, or your children’s eyes, setting their gaze on the words of certain books. I certainly wouldn’t want to subject my children to anti-gay hate-mongering, for instance, and I’d feel pretty strongly about such a book being in their school library. And parents should have the option to veto any material for their child – on a personal level. It may be terribly silly to veto a book, but if a parent chooses to be terribly silly, there is little anyone can do about it. It’s when it stretches to banning at schools, libraries, and other institutions that we all should be worried. Catcher in the Rye, J.D. Salinger. A lot of people don’t like this book; I loved it and it made me a fan of Salinger in general. Alice’s Adventures in Wonderland, Lewis Carroll. The older you get, the better this book gets. The Metamorphosis, Franz Kafka. A true classic. Catch 22, Joseph Heller. Absolutely one of my favorite books. Wish it was back on my bookshelf instead of in storage. So do yourself a favorite: pick up and read a banned book. Better yet, if you’re a parent, introduce your children to one. They’ll thank you later. This entry was posted in reading and tagged Alice's Adventures in Wonderland, Banned Books Week, Catcher in the Rye, Franz Kafka, Joseph Heller, Lewis Carroll, Libraries, reading. Bookmark the permalink.